I’ve been teasing it for days, so what is this big idea to celebrate the upcoming 200th strip? Send any finished scripts to zappit1234 AT gmail DOT com. I’ll be waiting! In the meantime, give Supervillainous a vote. It’s slipping a bit, and you all have forced me to resort to putting up cheesecake art as an incentive. I hope you’re happy. You can leave comments by clicking here, leave a trackback at http://supervillainous.spiderforest.com/comic/quirks-and-quarks/trackback/ or subscibe to the RSS Comments Feed for this post. “Atomically correct man” I actually read that as “Anatomically correct” which meant I got the joke right off the bat! LOL! Oooo that sounds like a really fun contest Zappit! I might try my hand at it… Any particular length or just enough to do a single page comic? I read it like that too. I, too, read it as “anatomically correct”, which made the joke work, as well! He looks a LOT like Meat. I don’t just mean because he’s bald; he’s got the same face. Ohhh does that mean Meat is a physically perfect nuclear superhuman. Or is it just confirming what we already knew in that meat is perfect? Or maybe Meat is related to them. 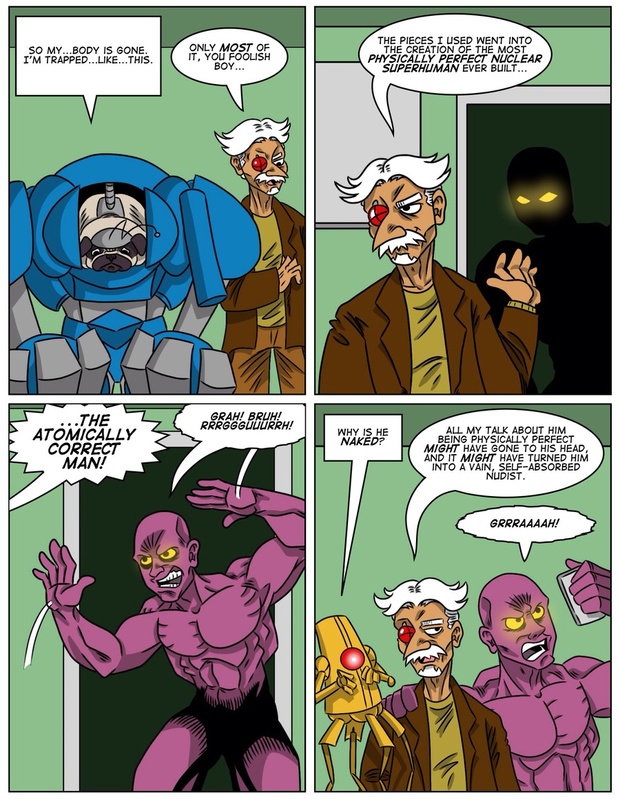 Well, at least when Atomically Correct Man goes on a rampage, he can be easily defeated by placing a mirror in front of him, that or go into a restaurant with a “No Shoes, No Shirt, No Service”sign. This is great. I love the direction this is heading. I only wish I’d not waited three weeks to read it! Ugh. I meant for this to follow RazorD9’s comment. Oh well.